pdgalles wrote: Edit: This is quite an interesting find Honestlynow, as Dennett delivered these lectures 7th Nov. 2001. Well, here's a piece by Daniel Dennett concerning 9/11 (on Iwise.com - the "wisdom-on-demand" website...). Yes, I linked to that passage in my previous post (DANIEL DENNETT AND 9/11), to support my comment about Dennett profiting personally from 9/11. I am not claiming that Dennett was "revealing" anything to the public through his lecture but the timing at only two months after 9/11 suggests he is "in the know". *Off topic: I fear I may have been tagged as a defender of such people after my DeLillo posts but I am as suspicious as everyone else of all people who live their lives "in the public eye" (ie. through the media). I would not stake my life on any of the ideas that I post here. I abandoned the DeLillo thread as it felt like it had the potential to cause trouble here, which is not at all what I want. "You just can't pull off a trick by airing 'ultrarealistic' computer renderings on TV. People wouldn't buy it." I believe you have misinterpreted Dennett's point - he was saying you could pull off a trick by airing 'ultrarealistic' computer renderings on TV. People would buy it (hence the line "even though millions of people had been thereby convinced..."). 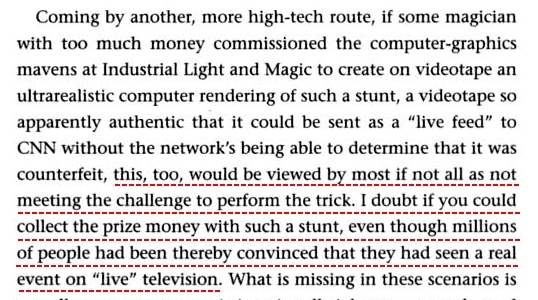 He was referring specifically to the method of video fakery as not being an acceptable performance of the Indian rope trick in order to collect the prize money he had talked about earlier in the chapter. Re-read from the start of the chapter that I linked to if not convinced. The whole article is very much worth reading. It gives me a great deal of pleasure to say that at least 15-20 of us here are not slaves. What good is an unprincipled military? An unprincipled government? An unprincipled society? What reason is there for these constructs to exist? The Nuremberg Trials solidified the reality that soldiers will be held accountable for following criminal orders, and still, there are some who claim that our troops must adopt a shoot first pay later methodology. The Obsession With The Law: The slave mentality, though illogical and psychotic, still requires a certain foundation to hold it together. The laws of governments tend to suffice. These laws may go completely against the force of inherent conscience, but because the slave has already abandoned listening to his inner voice of reason, this does not bother him much. If you have ever wondered why modern tyrannies always feel the need to put their horrific enforcements in writing first, THIS is why. Oligarchs understand that the law provides the slave with a means to rationalize his participation in the crimes of the state. After all, if some gut-bloated bloodthirsty elitists in government etch their mad inbred ramblings into law, then we have no choice but to follow them, right? The Need To Be Accepted: A slave seeks harmony not within, but without, even when that “harmony” is with a system that is designed to destroy him. The viciousness of collectivism lay in its ability to comfort converts with atrocity. As long as the slave feels as though he is a part of the machine, and accepted by the group, he cares not what the machine does to others. Common arguments include; “We all have to live together, and so we must sacrifice our selfish individualism for the greater good…” or “Governments are here to protect us and we should do everything we can to make their job easier…” Rarely if ever do they question if the system is legitimately helpful or harmful. The system just “is”, it fulfills their need to be coddled, and that is good enough for them. For all their talk of "unity" and the "greater good", collectivists are for the most part deeply selfish. They do not support or participate in the collective for the sake of others. They do it to satiate their personal desires. 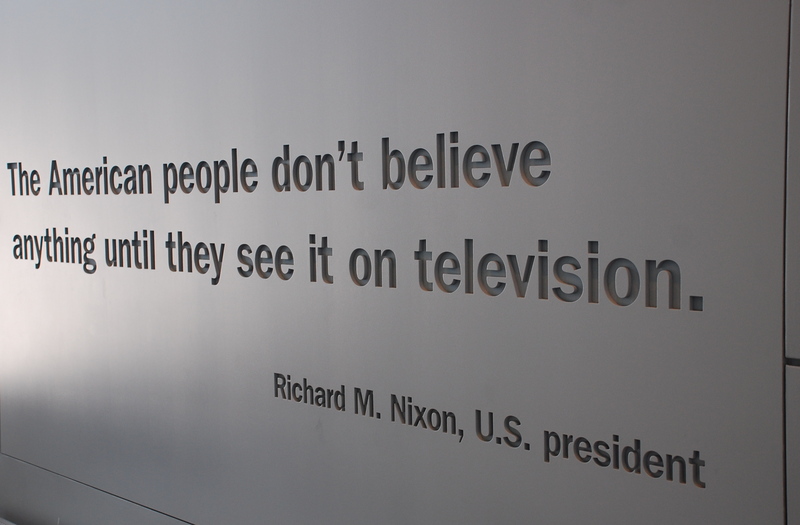 "The American people don't believe anything's real until they see it on television,"
So I was waiting at the division of motor vehicle recently in my state and they had several news channels on several different flat screen tv's above their heads (you know, as a courtesy to inform us with what's "going on" in the "real world") and my eye caught the attention of one of the flat screens, I think it was CNN, but not entirely certain, and they had a whole report on a "theory" (though they never mentioned it as such) of how our "political tendencies...ie republican vs democrat - cuz there is nothing else, see?..." are hard-wired aka genetically coded into us and all I could was...what total BS this was and what would be the agenda behind purporting such a theory. They listed "genetic traits" attributable to each political affiliation i.e. democrats tend to be slobs but open minded and have friends from all walks of life...on the other hand, republicans supposedly tend to be "neat freaks" and less sociable than democrats, but this is all genetically based, according to this report, and has nothing to do with our environment, or the media or their brainwashing techniques towards there are two, and only two, political affiliations one might have and that is republican or democrat. I couldn't help but being totally disgusted by the obvious ridiculous BS this was but at the same time wondering, what's in it for "them"...any thoughts out there? Guerrero wrote: They listed "genetic traits" attributable to each political affiliation i.e. democrats tend to be slobs but open minded and have friends from all walks of life...on the other hand, republicans supposedly tend to be "neat freaks" and less sociable than democrats, but this is all genetically based, according to this report, and has nothing to do with our environment, or the media or their brainwashing techniques towards there are two, and only two, political affiliations one might have and that is republican or democrat. I couldn't help but being totally disgusted by the obvious ridiculous BS this was but at the same time wondering, what's in it for "them"...any thoughts out there? On your first point, they obviously do this to further encourage every person to never think for himself. On your second point, I've seen the same type of analyses, and agree with some of the reasons and conclusions. But let's be honest, Dems are just as vigorously pro-war and pro-killing darker-skinned people as Repubs, as long as it is cloaked in the guise of "humanitarian intervention", instead of war, defense, or any other term that appealed to Repubs under Bush. Even the most die-hard skeptics among us believe in magic. Humans can't help it: though we try to be logical, irrational beliefs — many of which we aren't even conscious of — are hardwired in our psyches. But rather than hold us back, the unavoidable habits of mind that make us think luck and supernatural forces are real, that objects and symbols have power, and that humans have souls and destinies are part of what has made our species so evolutionarily successful. Believing in magic is good for us. That's what psychology writer Matthew Hutson argues in his new book, "The 7 Laws of Magical Thinking" (Hudson Street Press, 2012), released Thursday (April 12). Hutson scoured decades of research by psychologists in order to identify the supernatural beliefs we all naturally share, and to discover why the tendencies evolved in the first place. Here's the proof that you — yes, you — engage in what Hutson calls "magical thinking," and why. Psychology research shows most people wrongly assume their thoughts can become reality — even people who say they don't believe in telekinesis or ESP. "If you think about something and then it happens, you feel a little bit responsible for it," Hutson said. It's an irrational feeling. Why do we feel it? The faulty logic gets reinforced every time you think a positive thought, such as visualizing a successful basketball free throw, and then the thought boosts your confidence, which affects your behavior, and — voila! — the ball swooshes through the net. What do religion, anthropomorphism, mysticism and the widespread notion that each of us has a destiny to fulfill have in common? According to Hutson's research, underlying all these forms of magical thinking is the innate sense that everything happens for a reason. And that stems from paranoia, which is a safety mechanism. "We have a bias to see events as intentional, and to see objects as intentionally designed," Hutson explained. "Part of this is because we're always on the lookout for signs of other intentional beings — people or animals — so we tend to assume that if something happened, it was caused by an agent. If we don't see any biological agent, like a person or animal, then we might assume that there's some sort of invisible agent: God or the universe in general with a mind in its own. So the reason we have a bias to assume things are intentional is that typically it's safer to spot another agent in your environment than to miss another agent." Few Americans openly practice voodoo — e.g., inserting pins into figurines of their enemies in order to inflict bad luck or pain — but studies show we're all secret practitioners. "When you do some symbolic action or perform some symbolic ritual, you tend to think it will bring about what it symbolizes," Hutson said. Another possibility is that we get confused by the fact that, in the real world, causes are often similar to their effects. A big bolt of lightning causes a big crack of thunder. Red crayons draw red lines. Children look like their parents. "So we may then expect that if we perform some action, then some effect similar to the action will be caused," Hutson said.
. . . First and foremost, a truly creative endeavor takes us into the unknown. It takes us into experiences that have not been experienced by us and quite possibly not previously experienced by others. Mind only knows the past and what it has experienced. It will not necessarily know the truth of a situation unless it has the minimum set of requisite experience to understand what it sees and experiences. Turn off TV news entirely, and never again believe ANY straight news reporting from any source. But I think it’s just as important – even perhaps more so – to address and take heed of an equally disturbing, but quite different perception of the future, one held by Orwell’s peer Aldous Huxley, who once said quite presciently, "government-through-terror works, on the whole, less well than government through non-violent manipulation of the environment and of the thoughts and feelings of individual men, women and children." In other words, the successful tyranny is one with velvet chains, one that makes man "love his slavery." Huxley, who wrote Brave New World in this vein in 1931, made this statement in the 1950′s at the onset of post-war, television/advertising-induced mass conformity. Sci-fi writer Ray Bradbury, obviously impressed by Huxley’s vision, wrote Fahrenheit 451 in 1950, which, while borrowing from Brave New World in a broad sense – a world of self-imposed, self-enforced tyranny through ignorance and displaced gratification – brought it into the context of an American society already sliding into the vortex of anti-intellectualism, the homogenization of culture, the slow and steady surrender of liberty. Most importantly, Bradbury saw how the lobotomization of America would eventually disarm the people’s ability (and desire) to understand politics and foreign policy, allowing the government to wage war indiscriminately, putting the entire planet at risk of annihilation. Meanwhile, Republican presidential candidates and the nation’s leaders poke fun at "intellectuals" and going to college and question science and evolution. And the war is a million miles away. Let’s contemplate on whose interest it serves to keep that reality at such a distance and in blurred focus." The following excerpt sheds some light on how smart people can be fooled. William Schaap: I mean, after all, "conspiracy" just means, you know, more than one person being involved in something. And if you stop and think about it, almost everything significant that happens anywhere involves more than one person. Yet here there is a -- not a myth really, but there's just an underlying assumption that most things are not conspiracies. And when you have that, it enables a government which has a propaganda program, has a disinformation program, to be relatively successful in -- in having its disinformation accepted. The other reason why it -- why it works even though as we -- as we know, somewhere there are people who know it's not true. Somewhere they know you're lying about something. But another reason it works is that disinformation is very, very effective over time. The longer that you, whoever you are, can control the spin on a story, the more that spin becomes accepted as the absolute truth. And in this country the government has a great deal of power and influence over that spin. A. Well, this is an area where I had to consult with other experts because it turns out really to be a neurological function. And that was first explained to me by a -- a professor at Harvard Medical School. And it has to do with the way the human brain remembers things, the way we learn things, the way we create patterns and associations and reinforce -- well, I don't know how you -- it sort of like channels in the brain when certain things trigger certain collateral thoughts. And when you associate one thing with another over time, just the mention of the one brings the association of the other. What this will sometimes mean is that even when something is later exposed as a lie, if it was accepted as a truth for a long time, the exposure of it as a lie is not believed. It's in one ear and out the other." Sometime back with Steffi Graf [the female German Tennis Player just in case!] I remember the press in UK going on and on about her legs yada yada yada. She never floated my boat, ever, but I noticed a lot of my mates becoming 'transfixed' by her. It was definitely the continuous press over a lengthy period of time which made her out to be something that most people [well, al least me] initially though she wasn't ie a pretty girl. So there is definitely a window of opportunity which TPTB can control if possible and obtain favourable outcomes as a result. "It's only true if I'm told it's true in an entertaining way with song and dance. Otherwise, it's probably not true." Conscientiousness is a personality trait directly linked to success but has various interpretations. The two most basic definitions of conscientiousness are: 1. Thorough and diligent in performing a task. 2. Governed by or done according to somebody's sense of right and wrong. People who score high on this personality trait tend to do well in school, in life and professionally. "It's not a huge surprise if you think of it, that hard work (conscientiousness) would be a predictor of academic performance," says Sophie von Stumm, one of the authors of this study. "Curiosity is basically a hunger for exploration," von Stumm says. "If you're intellectually curious, you'll go home, you'll read the books. If you're perceptually curious, you might go traveling to foreign countries and try different foods." But how do you shake things up and kick-start your curiosity and conscientiousness and stop sleepwalking through life? I would recommend using regular physical activity as a valuable tool to fortify both of these personality traits. One of the most valuable lessons of "The Athlete's Way" is that through your daily workouts you have the power to strengthen character traits that will help you succeed in life - curiosity and conscientiousness are at the top of this list. One of the biggest drawbacks of being bored and careless is that your quality standard plummets. Once you become jaded, you no longer attack problems and challenges with enthusiasm and inquisitiveness. It's easy to get sucked into the ho-hum mindset of mediocrity. Having a blase 'been-there-done-that" attitude or cynical 'is-that-all-there-is?' response is the quickest way to find yourself trapped, discontent and at the back of the pack. Exercise is a way to turn this around--but it's easy to become bored and sloppy within your workouts, too. Remember to continually mix-it-up inside your workouts and to try different things at the gym. If you exercise outdoors, remember to stay adventurous and exploring new places and pursuing unfamiliar activities. You should consciously push yourself to remain curious and conscientious in mind, body and spirit. For me this means continuing to step out of my comfort zone in each of these areas. I am very pragmatic about it. I'll ask myself simple questions: Is this stretching my mind to a new perspective? Is my spirit awakening to a deeper connectedness? Is my body remaining adventurous and exploring unfamiliar and intriguing places? In a digital age with so much information overload and mindless 'noise' it is more important than ever that each of us makes a concerted effort to stay curious and conscientious with our minds, bodies and spirits. All ships rise in a rising tide. The more people we have exercising regularly across the country the stronger and more fruitful we will be as individuals and as a collective. To anyone who has ever had a discussion with friends or loved ones about the things talked about on this forum, it should be clear why smart people are fooled. The reactions you get in such discussions aren't rational, but almost totally emotional. They don't come from the mind, they come from the heart. People are very much emotionally invested with the fake world that's sold to us through the media, so much so that they become absolutely vicious when you try to explain how fake it is. I've experienced my best friends transform and suddenly act like I was their worst enemy. I've experienced my parents, who normally love to tell everyone how smart I am, make a 180 degree switch and call me a crackpot and a lunatic. It was surreal. They acted like I was attacking them personally, like I was trying to take some precious thing away from them. I recently watched a film that illustrated this phenomenon very well. It's called The Man from Earth. TheRideNeverEnds » July 28th, 2016, 9:06 pm wrote: To anyone who has ever had a discussion with friends or loved ones about the things talked about on this forum, it should be clear why smart people are fooled. The reactions you get in such discussions aren't rational, but almost totally emotional. They don't come from the mind, they come from the heart. People are very much emotionally invested with the fake world that's sold to us through the media, so much so that they become absolutely vicious when you try to explain how fake it is. I've experienced my best friends transform and suddenly act like I was their worst enemy. I've experienced my parents, who normally love to tell everyone how smart I am, make a 180 degree switch and call me a crackpot and a lunatic. It was surreal. They acted like I was attacking them personally, like I was trying to take some precious thing away from them. Becoming aware of the true happenings occurring around us is committing a symbolic murder : of the father figure, through whom we trust and build our ethical and moral value system. We must feel compassion, not anger ; understanding, not condemnation. The emotions are real ; the feelings are true. "OK, I admit that because of my critical attitude regarding the media, there is a tiny chance that there would be a real terrorist attack and I wouldn't believe it. But that would still be a good thing. The victims of terrorism and their families are not helped by our belief in them. It would still be a good thing because by disbelieving the terrorists you take away their power, and you thwart their objectives in a direct way. By trying to convince others it is real you are actually helping the terrorists. "